so, yeah, whats the typicla hp capable #s on this thing, like up to 650? thats my GUARD DUCK, it protects all my parts until they go on the car! more then likely thats the piece of scrap **** they sell on ebay for like a $300, thats from a european diesel truck, and doesnt have a regular t4, t3, or whatever bolt pattern to it. aka he gave it away because its useless. First of all, "ssautochrome" sells it on ebay...they're crap. But if you wanna believe them then you can run it at 35psi and make 650hp. id like to see that happen tho. meh decided to actually look into it. if its a *real* masterpower and not an ssautochrome one then apparently its decent except it's a .68 housing, which for a rotary, you should ramp that up to around a .96 if not larger. if its an ssautochrome one from ebay then the inside of the turbo is all generic and people apparently have had some abd failures with them. no one seems to be running over like 14 psi so no real big power numbers, at least nothing i can find. Yep there's a difference between the SS autochrome one a nd the actual, REAL Master Power stuff. We're using one of the MP T70's here and we like it quite a bit. 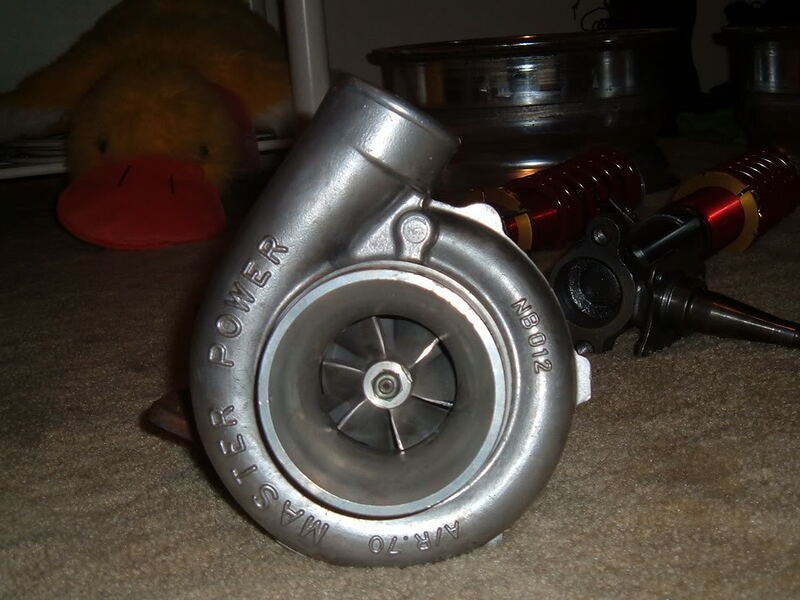 However, the MP turbo shown in the picture there doesn't look like one based on what I can tell. The compressor wheel looks to be too small. .81 ar would work well with that compressor. Any smaller no top end! yeah, you guys are too fu#4ing critical, was there anywhere in this post that i said i got this off ebay, does that housing say ssautochrome? no it doesnt. i got alex's name from a rep at garrett who said he the guy to talk to about an rebuild/upgrade and would be able to help me out. so i gave him a call and he works for master power turbos. but hey, hate all you want.